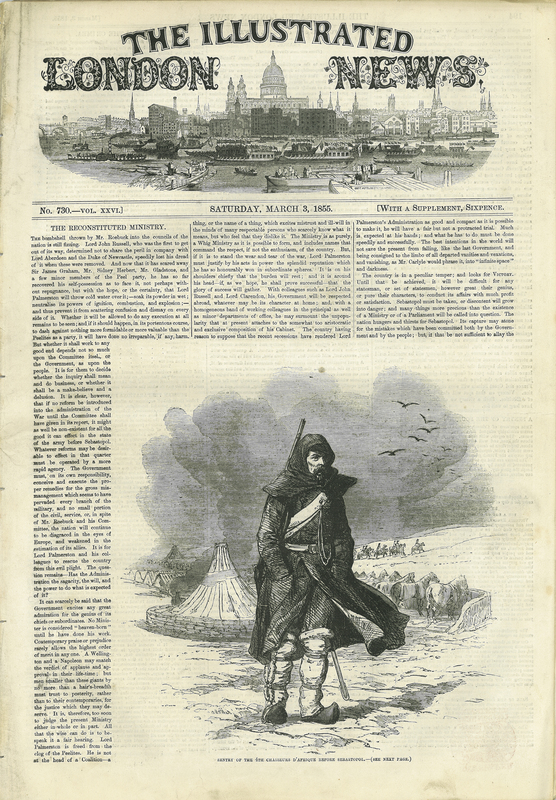 The Illustrated London News (1842-2003) transformed the reporting of current affairs, politics, and world events. It was the world’s first illustrated weekly newspaper, visibly different from its competitors. The ILN initially featured a large number of wood engravings; photographic reproductions began to appear in the 1890s. The paper sold at sixpence a copy and achieved impressive circulation figures through special editions, including the celebration of the opening of the Crystal Palace in 1851, and the death of the Duke of Wellington in 1852 . The ILN’s reputation was confirmed by its reports and photographs from the Crimean War in 1855, when sales reached more than 200,000 copies a week. [Herbert Ingram], “The Illustrated London News, vol. XXVI, no. 730,” ourheritage.ac.nz | OUR Heritage, accessed April 22, 2019, http://otago.ourheritage.ac.nz/items/show/10800.